Amps and volts, go together like pretzels and mustard, at least in Philadelphia. Where were we? 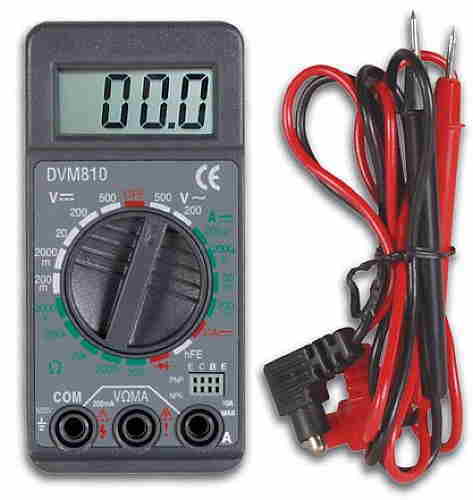 Yes, you pick from our 0-10VDC in 0.2 volt increments voltmeter or the zero-adjust ammeter (Galvanometer) that reads bipolarity up to 500mA in 20mA increments. Both are in black plastic housings, 4" x 5-1/2" x 3-3/4" with a slanted face and red & black banana jack terminals. 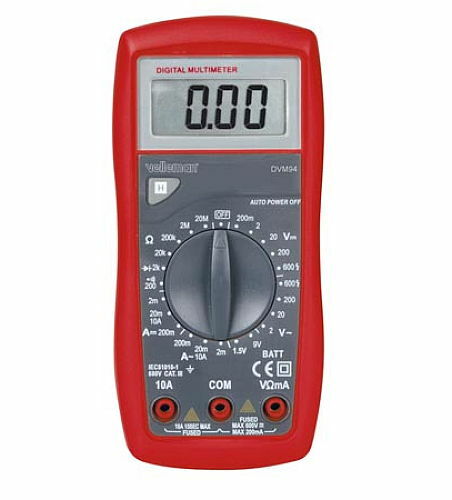 3-1/2 digit LCD electrical multimeter with a max reading of 1999. 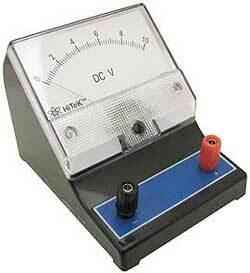 Measures (5) ranges of DC, (2) ranges of AC voltage both to 500 V, (5) ranges of resistance to 200K ohms, DC current to 10 Amp., diode test, transistor and battery test. 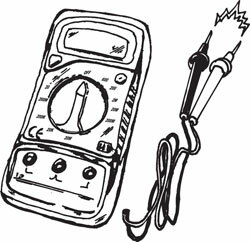 A pocket sized 2-7/8" x 5-3/4" x 1-1/2", it comes complete with test leads and 9 volt battery. The best value for this size we have seen. Our pocket-sized multimeter measures a tiny 3-5/8" x 1-3/4" x 1" thick, with a 3-1/2 digit display on a 1-1/4" x 9/16" LCD screen. Will measure up to 500VAC, 100VDC, current from 200uA up to 10A, resistance up to 2000K ohms, and will also test diodes and transistors. Comes with (2) 24" test leads and a battery to power it. Teeny price to match its size. Great for science fair projects. And save a bundle. 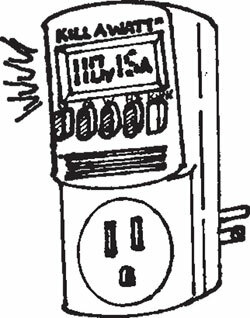 The "Kill-A-Watt" plugs into a wall outlet and accepts the power line for any devices or appliances that draw up to 1875 watts. 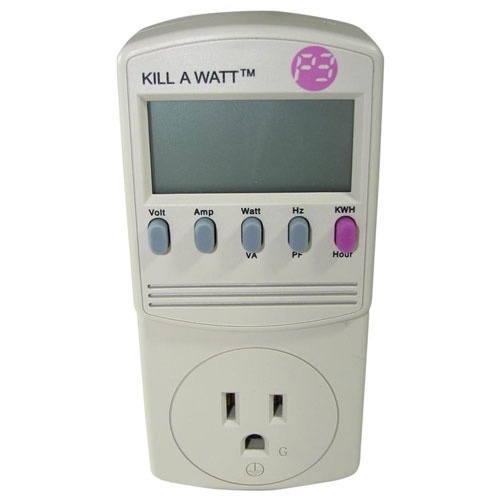 Identifies energy eaters, tracks efficiency and costs over time, and checks on your electricity provider by monitoring voltage, current (amps), watts, kilowatt hours, frequency (Hz), volt amps, power factor, and elapsed time. 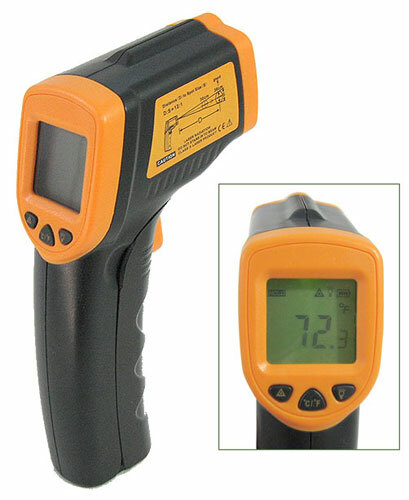 Measures 5-1/8" x 2-3/8" x 1-7/16" with a 1-3/4" x 11/16" LCD screen. You may never use a waffle iron again. 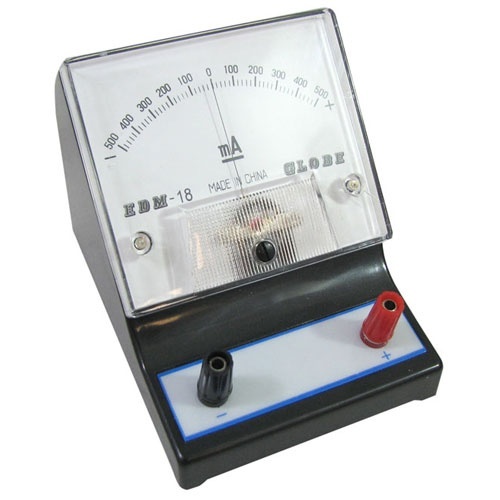 Here's a cost-effective tester that lets you determine the electromagnetic field around power lines, appliances, computer and communication equipment and industrial devices. 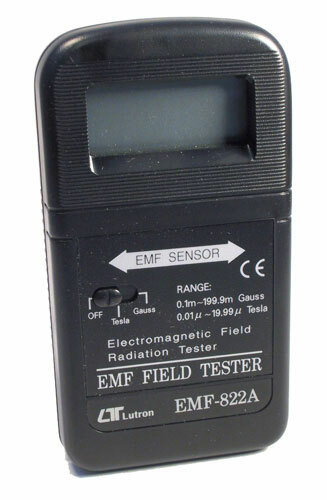 The hand-held instrument measures EMF radiation from 30 to 300 Hz. Single axis. The range is 0.1-199.9 mG and 0.01-19.99 uT, with an accuracy of +/- 4%. 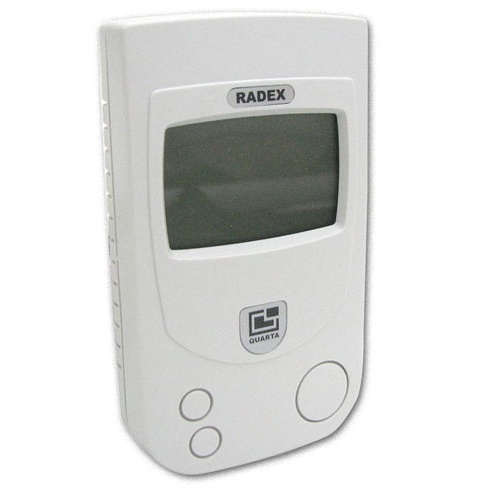 The 5" x 2-3/4" x 1" plastic case has a 1-3/4" x 3/4" LCD display and a switch to toggle between micro Tesla and milli Gauss. It's quick, easy and reliable, and when you see the EMF around your old monitor, it will give you one more reason to buy the new one you want! 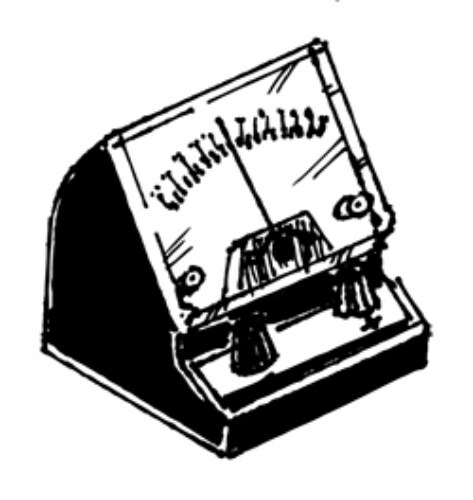 This new take-out analog/ballistic meter, a genuine science device, was intended to measure electrodermal activity in humans, if you're into that kind of thing. (We make no judgments here at the home office, lest we be judged.) 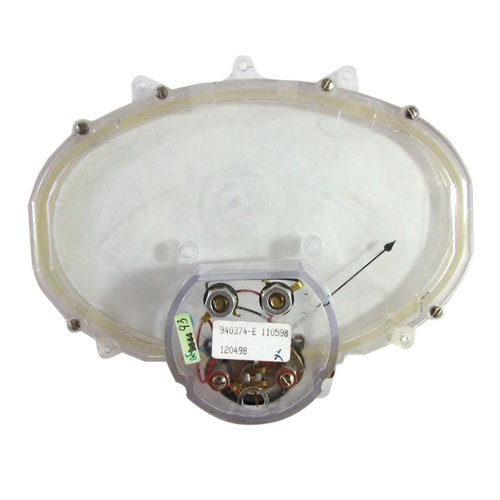 Has a clear acrylic elliptical face, 6-1/8" x 4" with a 2-1/4" x 2" x 1-1/4" housing for the mechanism on the rear bottom, along with a pair of screw terminals. 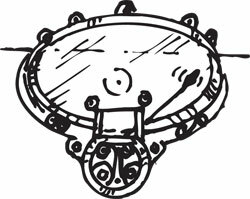 No scale, but full deflection is at 125uA.